﻿ HuntingNut » Forums » Firearms, Shooting & Reloading » Reloading Ammunition » Wildcatting who here does it ?? NAMED! 416 CANUCK! Wildcatting who here does it ?? NAMED! 416 CANUCK! Posted: Sun Sep 09, 2007 12:29 pm Post subject: Wildcatting who here does it ?? NAMED! 416 CANUCK! Anybody design their own wild cat here ?? Firstly how do you decide where to put your starting loads ?? Secondly where would you get the dies from ?? Thirdly where do you get custom chamber reamers ?? I'm still obsessed with producing my own 40 caliber round and I was thinking about it all night last night now that I got a press it would be one step easier. I'll post a CAD drawing of the round once I finish it up and the technical spec's. Posted: Sun Sep 09, 2007 1:06 pm Post subject: Re: Wildcatting who here does it ?? Posted: Sun Sep 09, 2007 1:37 pm Post subject: Re: Wildcatting who here does it ?? Hello Dimitri. I have only exercised makin cases from 7x57, 8mm Mauer and 30-06 to 308. Also 8mm Mauser and 30-06 to 9,3x57. There are already so many vildcats. 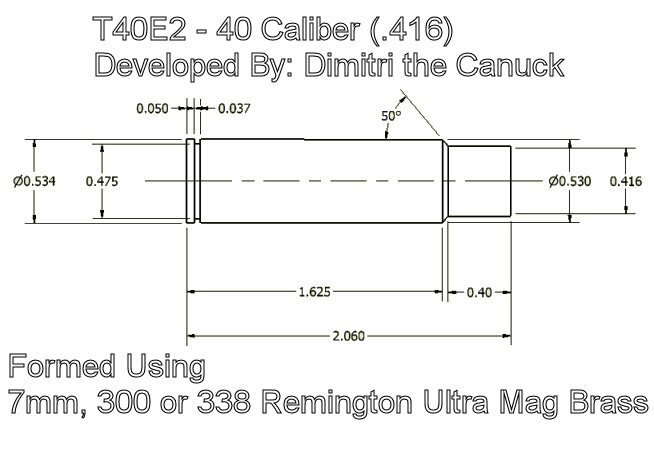 I was thinking about 308-bullet to 357 Rem maximum case for T/C Contender. But there is 30 Herret. much better, I am thinking so. Posted: Sun Sep 09, 2007 2:04 pm Post subject: Re: Wildcatting who here does it ?? I have done "one" ..
Are you gonna do it off an existing case ?? Is much easier if ya do ..
You gimme the case dimensions and I can give you some idea of what the performance and powders , as well as pressure will be .. Dies ?? HHMM RCBS used to do custom ones , dont know if they do anymore or not .. Maybe Sinclair ..
Reamers ?? Clymer , you send them your dimensions and they will build a reamer , and usually will work with a die maker to do the dies .. It's fun , and very expensive to do ..
At the moment , after runnin' my mouth off , a freind who is a PH in Africa , asked me about a widcat he has wondered about , the numbers intially look really good , and there is only one caliber in it's class that may be more potent .. We may run with it when he returns in December .. Or at least discuss it further ..
Posted: Sun Sep 09, 2007 2:16 pm Post subject: Re: Wildcatting who here does it ?? Well this is my idea, a heavily modified 7mm, 300, or 338 Remington Mag Case to forum a shorter 40 caliber (well .416) round. I didn't know what to name it so and I remembered how the US military used to name their developmental rifle names with a "T" so I used 40 as its the caliber and then since this is the 2nd design (shortened it from the first design) its the "E2" model. I'll have to come up with a name later on. There is a slight taper on the case, alittle more then the RUM's normally have as its the same taper over a shorter distance (base of the case is .550" not shown on the drawing). Its pretty much a whole half inch shorter then the 416 Taylor. Posted: Sun Sep 09, 2007 2:21 pm Post subject: Re: Wildcatting who here does it ?? I have a copy of your dimensions in front of me , will throw them in the program , and see what it says .. I will PM or email you the results , whichever you prefer .. Gimme abt five minits ..
Posted: Sun Sep 09, 2007 2:22 pm Post subject: Re: Wildcatting who here does it ?? Cool! Thank you Groovy Jack! I sort of cheated when I did the drawing I just realized forgot to put the whole .550 dimension so the taper doesn't show, will have to correct that. Posted: Sun Sep 09, 2007 4:17 pm Post subject: Re: Wildcatting who here does it ?? Case Capacity: 80.3gr of water. Recoil Calculation: 35.89ft/lb on a 10lb rifle, 23.92ft/lb on a 15lb rifle. Taylor Knockout Factor of 47.54. Posted: Sun Sep 09, 2007 5:00 pm Post subject: Re: Wildcatting who here does it ?? Well we have slight differences ..
My Powley calcs them three powders at 55.3 with 1997 fps ..
Posted: Sun Sep 09, 2007 5:02 pm Post subject: Re: Wildcatting who here does it ?? Oh I see, Guess Load from a Disk is reading it differently. I used .200" as the web thickness, .040" for the wall thickness and .020" for the sholder thickness, the same as it gave me for the 300RUM when I looked it up, and the neck is .015". Would this play much of a difference ?? Posted: Sun Sep 09, 2007 5:11 pm Post subject: Re: Wildcatting who here does it ?? I figgered .452 as outside neck thickness ..LFAD showed the .300 RUM with a neck thickness .036 more than bullet diameter .. Mine showed .300 RUM web at .200 , then .041 and .020 for the other two figgers ..
Dont losse any sleep over the diffs between the two ..
Posted: Sun Sep 09, 2007 5:17 pm Post subject: Re: Wildcatting who here does it ?? In general the thickness of the cartridge case neck is about 0.015 inches which is an industry standard. So the outside neck diameter I used was .446"
If you say I shouldn't lose any sleep over it I wont! Posted: Sun Sep 09, 2007 5:31 pm Post subject: Re: Wildcatting who here does it ?? HI Mr.D. What weight bullet were you going to use. 300,350, or 400gr? Posted: Sun Sep 09, 2007 5:32 pm Post subject: Re: Wildcatting who here does it ?? I'm going to be using 400gr bullets, no sense building a gun in this large of a caliber and then use lighter ammunition. Posted: Sun Sep 09, 2007 5:33 pm Post subject: Re: Wildcatting who here does it ? ?